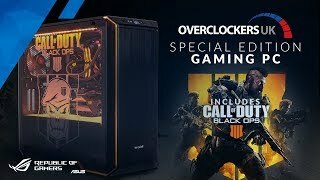 Be battle ready with Overclockers UK's Call of Duty: Black Ops 4 Gaming PC! With more than a decade's worth of experience building the finest systems, Overclockers UK has now built the perfect partner to the latest Activision published and Treyarch developed Black Ops game. Powered by Asus, not only does this special edition system use the latest innovative technology but careful attention has been used on its aesthetics. The system's case features an eye-catching COD: Black Ops 4 logo etched on the tempered glass side panel as well as a custom designed TechForge RGB lighting box for advanced illumination effects. Show your loyalty to the series with this outstanding creation! Asus ROG Ryuo AIO liquid cooler with LiveDash proudly displaying the COD: Black Ops logo. Call of Duty: Black Ops 4 is the latest game in the long running series developed by Treyarch and published by Activision. Black Ops 4 will have an emphasis on multiplayer combat with the introduction of a Blackout mode that has battle royal style matches. Also with the ten year anniversary of Call of Duty Zombies coming up, there will be three Zombie scenarios available from day one. A bundled copy of the game with the system will let you experience all this. This Overclockers UK special edition system utilises a be quiet! Dark Base 700 RGB case. Already a stylish and well proportioned case, Overclockers UK have further improved its design by laser engraving the officially licensed Call of Duty: Black Ops logo on the case's side window. The system’s pre-installed TechForge RGB lighting box is capable of creating impressive RGB-lighting effects. This further enhances the look of the case and creates a striking contrast with the custom etching. A special edition system also requires a unique cooler. Overclockers UK has specifically selected the Asus ROG Ryuo in part due to its powerful liquid cooling performance but also due to its innovative 1.77" LiveDash colour OLED panel that is proudly displaying the COD: Black Ops logo. COD: Black Ops 4 will only perform at its best on a powerful system. With the game supporting 4K resolution, HDR and ultrawide monitors you need a computer that can pack a punch. At the center of this special edition is a equally high quality motherboard from ROG. This motherboard also features COD branding and has excellent specs. A powerful Intel special i7-8086K anniversary edition CPU powers this monster gaming rig. Overclockers UK have included a great selection of powerful GPUs you can add to the system, including the latest RTX graphics cards from NVIDIA. All this is assembled for you by our experts at Overclockers UK! More links for "Blackout - Call of Duty® Black Ops 4 Custom Powered By Asus Gaming PC"